People perusing the frozen food aisle at their local supermarket may find themselves scratching their heads at a new packaging logo; while people shopping for a new microwave oven may find themselves perplexed with a newly added cooking button labeled “TrueCookPlus.” Exactly what is this packaging logo and corresponding microwave oven feature? TrueCookPlus software presently resides within the microprocessor on select Kenmore and LG microwave ovens, and essentially standardizes the optimum cooking time for frozen foods–accounting for all of the variables that impact the cooking time of microwaveable foods, such as oven temperature, wattage, oven size, voltage, altitude and power settings. In essence, it enables you to consistently and perfectly prepare frozen microwaveable meals and snacks every time. Because the food is cooked perfectly every time, it eliminates the risks of food poisoning related to undercooked food. The directions are designed to meet food-preparation recommendations put forth by the USDA and FDA (FSIS). Today, the TrueCookPlus logo appears on nearly 120 different foods from brands like PopSecret, Pinnacle, Hot Pockets, Emerald, Diamond, General Mills, Heinz North America and Celeste Pizza. By the end of this year, 210 frozen food products will feature the TrueCookPlus logo, including products under the Hungry Man and Aunt Jemima brands. TrueCookPlus will soon begin working with some of the top organic frozen food manufacturers as well. Step 1: Press the TrueCookPlus button on your microwave oven. Step 2: Enter the TrueCookPlus numeric code printed on the packaging of your food. When you enter the TrueCookPlus product code, the software technology takes control and manages the microwave oven cooking based on the variables listed above – plus oven age, oven temperature when food was inserted, food weight and standing time, cook times and food temperature. The codes are descriptive, and not unique to one particular food product, which means that the 10 million TrueCookPlus codes will support an unlimited number of foods, and changes to the codes won’t require updates to the software on existing machines. TrueCookPlus-enhanced microwave ovens retail for between $119 and $139 and are currently available in black, white and stainless steel at Best Buy and Sears. 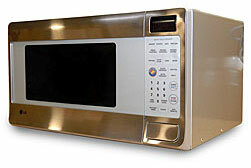 The company plans to rollout above-range microwave ovens with TrueCookPlus technology soon. Thanks so much for the awesome post Heidi! I used to look up the codes on their website. But, in summer of 2018, the website stopped being available. They did not respond to email. They did not respond to Facebook Messenger. Did they go out of business? If so, are the codes they did create archived anywhere?